This post is something of a first for Soult’s Retail View – a proper book review! 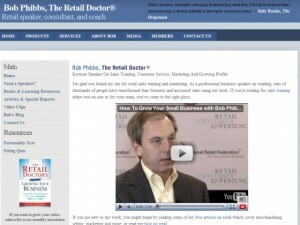 Before I talk about the book – which is the The Retail Doctor’s Guide to Growing Your Business, by Bob Phibbs – it’s worth just mentioning how I got to hear about this new title in the first place. After years of LinkedIn feeling like a rather static and worthy business networking environment, the recent growth of its Groups feature has really brought the community to life. I’ve had my LinkedIn account for a while, and now belong to several worthwhile retail-related groups. The largest and busiest of these is the Retail Industry Professionals Group, a community with almost 55,000 members worldwide and many active discussion threads. Currently, the most popular of these threads – with 100 comments, and rising – is one entitled “Who has a blog re: to retail out there?”, where, as you would expect, I flagged up Soult’s Retail View a few months ago. It was as a result of this post that I got a message from Bob Phibbs himself, suggesting that I review his new book. With a copy of the 246-page book duly having arrived from the United States, I’ve been delving into it over the last couple of weeks. So, what did I make of it? Well, even before I agreed to review the book, I did query whether it was being actively marketed in the UK – assured that it was, I felt qualified to critique it from a British perspective. Even so, the first thing to say is that the book is *very* American. The anecdotes are American, the style is American, and the language is American – and some of these may jar with UK readers. The terms ‘clerking’ and ‘merch’, for example, were new to me, alongside the inevitable references to ‘lines’ rather than good old British ‘queues’. More generally, some might find The Retail Doctor’s tone a little preachy – he knows what he’s talking about, and the book makes sure that the reader doesn’t forget it, to the extent of making slightly comical use of a trademark symbol everytime ‘The Retail Doctor®’ is referred to. Coming across rather curiously to British eyes, this risks portraying the author as a corporate entity or brand, rather than as a real person. 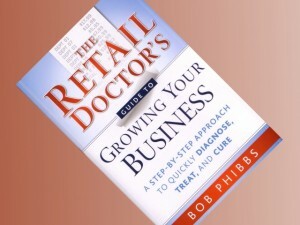 So, there are a few negatives to get out of the way to start with – most of them entirely relating to The Retail Doctor’s Guide to Growing Your Business’s American feel and focus. However, as long as you can look beyond these niggles, it’s hard to dispute the book’s value as required reading for small retailers, whichever side of the Atlantic they may be on. The book as a whole is pretty easy reading. I read it through from start to finish, which is probably the best way of doing it, though the clear division of topic areas between chapters – such as financials, hiring, selling and training – make it straightforward to also dip in and out. One of the threads running throughout the book is the importance of understanding how personality types affect a business, with Phibbs introducing the four groups of Drivers, Analyticals, Expressives and Amiables. Drivers and Analyticals are collectively known as ‘Thinkers’, with both displaying qualities of independence and decisiveness. However, while Drivers are confident and extrovert, Analyticals are more likely to be aloof and introvert. Similarly, Expressives and Amiables, as ‘Feelers’, share the quality of being dependent. However, just as Expressives are talkers, extroverts and ideas driven, Amiables are introverted, indecisive peacemakers. A successful retail business, Bob argues, needs a combination of all four personalities, with the manager needing to make sure that their employees bring in whatever character attributes they themselves lack. Progressing through the book, much of what The Retail Doctor says is common sense, yet it’s surprising how much of it needs to be restated – often quite forcefully. The book’s cover promises “no-nonsense” advice, and Bob certainly doesn’t mince his words. Similarly, as early as p.3, Bob is making clear that “you have to be profitable”, with profits meaning that “customers are rewarding you for your efforts in excess of what it costs you to run the business.” In contrast, he suggests, “if you are not making a profit, the market is punishing you for poor management, meagre product selection, inadequate location, or rotten employees.” Harsh, perhaps, but surely the essence of why businesses fail. In this context, I liked Bob’s statement that “no amount of promotions, events or buzz can change a store’s unwelcoming exterior, shoddy facility or bored employees.” Indeed, his anecdote of a coffee house with dirty counters, broken lighting, and staff who are more interested in talking to themselves than the serving the customer surely strikes a chord with anyone who has had a similarly underwhelming customer experience. An important chapter of the book is that which covers online marketing, giving effective advice on developing a website – something, Bob notes, that about 30% of attendees at his keynote speeches still don’t have. I particularly liked the illustration on p.182 of what Bob calls a “rotten title bar”, where instead of the name of the website and appropriate keywords it simply says ‘Home’. How many times have we all seen that, often on sites belonging to businesses that really should know better? The book’s newness also means that it’s bang up to date in offering tips on how to use social media effectively – including Facebook, YouTube and Twitter, though not, ironically, LinkedIn. Notwithstanding the book’s American focus and tone, this is clearly a lesson that can be applied in the UK as much as the US. Armed with Bob’s book, small retailers should be well equipped to harness the power that they do have over their own businesses – building on their strengths, tackling ther weaknesses, and working to create a customer experience that is distinctive, engaging, and that – above all – sells.